Egged spokesman tells Arutz Sheva the situation was 'out of the ordinary', incident may lead to driver's firing. 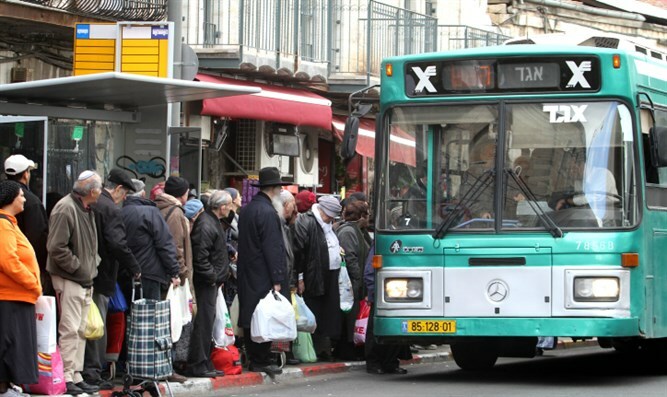 Egged spokesperson, Ron Ratner, spoke to Arutz Sheva today regarding a video that features an Egged bus driver yelling at and cursing a passenger who was later revealed to be an IDF soldier. The bus driver was apparently yelling because the soldier hadn’t validated his ticket before entering the bus. The incident occurred on Jerusalem line 75 in which passengers can board the bus through all doors and validate their cards independently at electric kiosks. A soldier, who serves in Army Radio and carries a pass that allows him to ride public transportation while not in uniform, boarded the bus through one of the doors. The bus driver yelled at him for not validating his card and the situation escalated from there. “If the driver had just asked to see the young man’s permit, the situation would never have escalated,” Ratner stated. Ratner explained that the driver’s reaction was not indicative of Egged drivers’ behavior in general, emphasizing that this case is quite out of the ordinary. Ratner emphasized that this behavior does not reflect that of thousands of Egged drivers and the company has summoned the offending driver to a meeting that may very well result in his firing.